What’s in a name? Swipe Buster, Swipebuster, or Cheaterbuster. I decided to write this post to tell our users a little bit about the importance of a name, especially for an online product (app, website, etc). When we launched the site we decided to call ourselves Swipebuster to use a descriptive name of what our site does. This would make it easy for people to understand the product. For some reason, a large portion of the media who covered us decided to call it “Swipe Buster”. That is two words instead of one. You could think of this as inconsequential, but has actually turned out to be a huge problem. It created confusion for people who look for us online. This has gotten to the point where some users can’t even find us. You may think something so simple should be easy to control. I mean the media must ask you information about the product, your name at the very least, before posting stories about you correct? Wrong. Most media articles actually copy, or paraphrase news from other sites. So any mistake whether factual or even grammar/spelling gets propagated like a wildfire of ignorance throughout the internet. For us this case of “fake news” or error propagation affected our most important message, our brand. 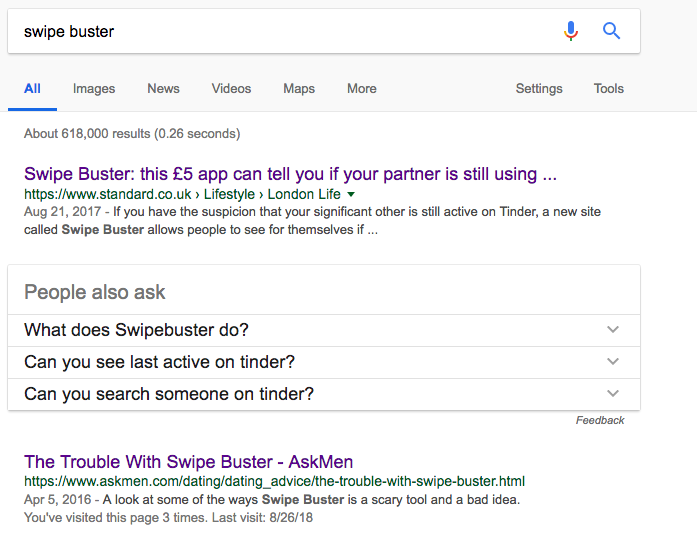 If you google “Swipe buster” now you can almost find more articles that have the misspelled name than articles who spelled our previous name correctly. Because of this, when we rebranded to Cheaterbuster, we realize basically very few people were able to find us. We strongly feel that our site, product, Swipe buster, Cheaterbuster, whatever you want to call it actually provides a positive service to our users. This is something most of our users feel as well. Now, everyone looking for Swipe buster based on the myriad of articles that were written about us can’t actually find us. This reminds me of the current “fake news” dilemma. I think media in general, especially online media has devolved into a click contest. A place where every site wants to be the first to put out the story regardless of the facts. There is no such thing as fact checking anymore or it’s uncommon. I would bet a steak dinner 50% or more of the authors didn’t even bother visiting Swipe buster (as they call it). Or they would’ve had immediately seen that the actual name was SWIPEBUSTER. Right there in the logo. Or even tested the site for that matter. The point I wanted to make is: choose your name wisely. Avoid any potential confusions.Try to get your message across about what your product does, how, when, etc… or the media will fill in the blanks. They will use any information they can copy paste from other sites, including their spelling mistakes.